Every so often you get that itch. The itch to just gas up the car and go. Maybe you’ll cruise California’s Pacific Coast Highway, or take a nostalgic trip along Route 66 — with no particular destination in mind. After all, a road trip is all about the journey (whether in the car or out). And there are always plenty of interesting natural and unnatural sights to see along the way. The next time you’re out on the highways, byways, and back roads of America — scratching that little itch — keep your eyes open for one of these quirky roadside attractions. Every great road trip starts with donuts. And Randy’s has a great variety of donuts of all shapes and sizes. Built in 1952 and measuring over 32 feet in diameter, the colossal donut that sits atop Randy’s has been featured in movies and TV shows and remains a must-see roadside attraction. Nothing goes better with a giant donut than a tall glass of milk. And the 40-foot-tall Hood Milk Bottle in Boston seems to have been made with Randy’s glazed monster in mind. Posed in front of the Boston Children’s Museum, the towering bottle doubles as an ice cream stand and snack bar – not to mention a killer photo-op. Although technically not located right by the road, it’s well worth the detour, even if you’re lactose intolerant. The bottle, if it were real, is said to be big enough to hold over 58,000 gallons of milk. That’s a lot of bathroom breaks for any road tripper. Paul Bunyan, the famous lumberjack of American Lore, and Babe his big Blue Ox, get around. Their monumental statues have been spotted by the road in Klamath, California and Bemidji, Minnesota don’tcha’ know. Giant Paul Bunyan statues are also found near highways in Banghor, Maine and Portland, Oregon—a safe distance from Randy’s donuts and Hood’s milk, which would make a very nice snack for the giant lumberjack. Once a small town drugstore, Wall Drug’s savvy owners seized a golden opportunity by offering free ice water to thirsty tourists headed to nearby Mount Rushmore. Today, Wall Drug is a thriving drugstore/shopping mall with its own 80-foot Apatosaurus dinosaur mascot, beckoning to the steady stream of cars on Interstate 90. 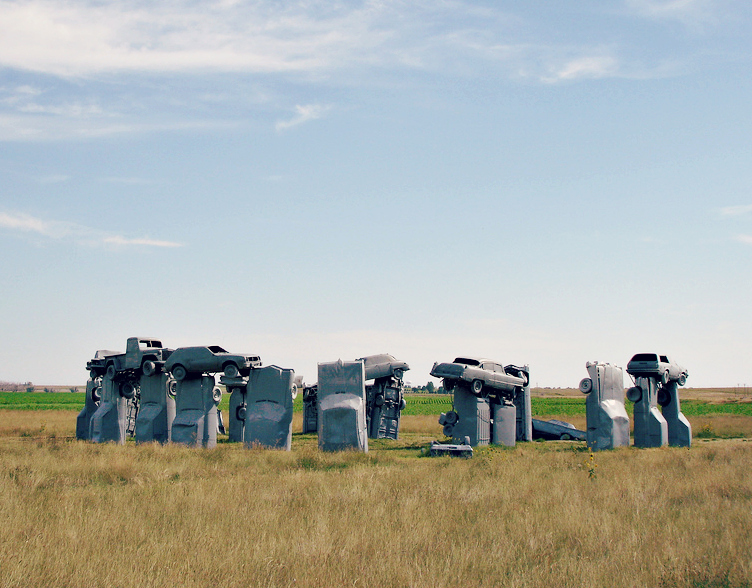 Carhenge is an impressive answer to the question, “What if the Druids had settled in Detroit?” Boasting a fleet of 38 cars planted on a Nebraska prairie, this frozen traffic jam sendup of England’s Stonehenge is a must-see not easily missed. Not to be confused with “Hole in the Wall”—the famed Utah hideout of Butch Cassidy—Hole n’ the Rock is a road trip attraction you have to experience to believe. Created by excavating 50,000 cubic feet of sand stone, this massive carved out cave features 14 rooms, all completely furnished and available for travelers to take in. And the petting zoo makes Hole n’ the Rock a quirky little pit stop for the whole family. They say that elephants never forget. And one roadside attraction you’ll never forget is Lucy the Elephant, on Atlantic Avenue in Margate, New Jersey. Standing 65 feet tall, this 130-year-old pachydermal building packs an impressive visual punch. Spiral stairs inside Lucy lead visitors to unforgettable views of the Atlantic Ocean from the giant howdah on her back. Predating “Carhenge” by roughly a decade—according to automotive archaeologists—Cadillac Ranch was created by a group of artists in 1974. Two themes dominate Cadillac Ranch, one being graffiti and the other being well…Cadillacs. Big-finned Cadillacs planted nose-down in a slanted row in a cow pasture along Texas’ Interstate 40. Okay. This one’s off the beaten path a bit. But what road trip would be complete without a detour to see the World’s Largest Ball of Twine? Located in Cawker, Kansas, the enormous sphere of sisal twine weighs in at nearly 10 tons and growing. The ball is expanding because visitors are given lengths of twine that they can add-on themselves, free of charge—no strings attached. Defensivedriving.com has a ShopperApproved rating of 4.7 based on 81366 ratings and reviews.